Zanba and Yak Butter Tea are Tibetan favorite Tibet Food & Drink in every Tibetan family. They have played a big role in local Tibetan food culture. Here below is some general information about Zanba and Yak Butter Tea. 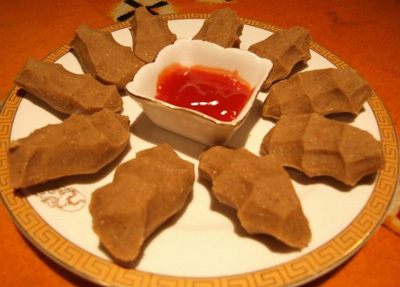 The staple food of Tibetan people is Zanba, a kind of dough made with roasted highland barley flour and yak butter with water. The process of making Zanba is first roasting the barley seeds, then grinding it into flour, then mixing it with ghee. It is similar to making flour by northern Chinese people while northern Chinese people grind first and roast next. What’s more, Tibetan people do not remove the husk of the Barley. When eating Zanba, Tibetan people usually put some ghee in a bowl and pour some boiled water and roasted flour into the bowl. After that, they mix them with right hand. When mixing the tea, they press the flour slightly against the edge of the bowl with their fingers to avoid spilling the tea. After mixing all the roasted flour, tea and ghee, the dough gets thicker, and people knead it into dough balls and eat them. Tibetan people use hands or spoons instead of chopsticks when eating. Yak Butter Tea (which is called Su You Cha in Chinese) is the favorite drink of Tibetan people and people drink it every day. Tea plays an important role in Tibetan people’s daily life. 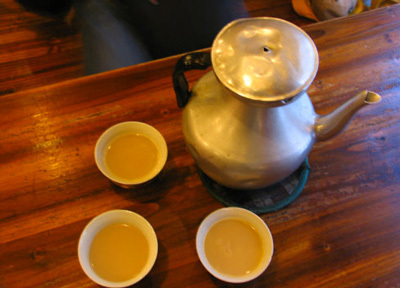 Yak Butter Tea is made of boiled brick tea and ghee. Ghee looks like butter. It is a kind of dairy product of fat abstracted from cow milk or sheep milk. Tibetan people like the yak milk which they call it ghee. Tibetans use unique wooden bowls instead of cups for Yak butter tea. In a family, each person has his or her own bowel. And men’s bowls are always bigger than their wives. When visitors come to a Tibetan family, the host will present them with tea and then they will sit down and begin to chat. The host will refill their guests’ bowls continuously. But if a guest stops drinking and allows it to get cold, the host will dump it out and refill it with fresh one. Drinking and presenting Tibetan tea has become an integral part of every Tibetan’s life. According to the local customs, when a Tibetan woman gives birth, her relatives will visit with tea on the second day if the woman has a son but on the fourth day if she has a daughter. Welcome to learn more about Tibet Food and Restaurants!